Brunonia Barry’s second novel The Map of True Places is the story of Hepzibah Finch, known as Zee, a Boston therapist. When her patient Lilly Braedon commits suicide, Zee’s life spirals out of control—how could she not have seen the suicide coming? After all, wasn’t Lilly so much like her mother, who committed suicide about twenty years ago? Zee visits her father in Salem only to find the medication he’s taking for Parkinson’s is causing him to have hallucinations that he’s Nathaniel Hawthorne. Furthermore, she discovers that her father, Finch, has broken up with Melville, his partner for about twenty years. Suddenly Zee doesn’t know what she wants. Should she remain a therapist? Is she even a good one after what happened to Lilly? Does she still want to marry Michael? After my recent visit to Salem, I enjoyed this book very much. 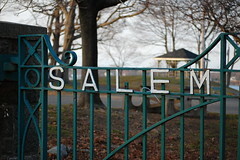 The novel is set mostly in Salem. I pulled out my maps a few times to remind myself exactly where Barry’s locations were. I had visited some of them, including the House of the Seven Gables, across the street from the home where Finch and Zee live, Sixty2 on Wharf, Nathaniel’s, the Peabody-Essex Museum, and Ye Olde Pepper Companie candy store, just to name a few. Barry writes with a clear sense of place, and the city is almost another character in the story. She draws in characters from The Lace Reader toward the end—Ann Chase most prominently, but also Rafferty and mentions of Towner and May Whitney. Barry places Ann Chase’s witchcraft shop on Pickering Wharf, right about where Laurie Cabot’s shop is. I know I enjoyed this book more for having visited Salem such a short time before reading it, especially because this book focuses much more on the maritime history of Salem than the witchcraft history. When I visited I really felt a much stronger sense of Salem as an old trading port and imagined the ships returning from exotic places laden with spices two centuries ago. The plot of the novel is intricately woven, and Barry doesn’t drop a thread. Every puzzler or detail she mentions is resolved by the end, but each had me wondering for most of the book. Why did Melville and Finch fight? What about that strange fortune teller’s story to Zee’s mother? It was obvious too that Barry had done her research about mental illness and her own experiences with her father’s Parkinson’s lend authenticity to Zee’s experiences with Finch. I think the cover of the novel is gorgeous. I love the colors. The cover is a perfect evocation of the novel’s theme of finding yourself—the novel is really more about Zee trying to figure out who she is and right herself as her world is turned upside-down. I picked this book up late last night and read into the wee hours of the morning. When I woke again, I read straight through until I finished with a few breaks on the computer. I love being swept away by a book, and it was such a lovely visit back to Salem. Full disclosure: I won this book as part of a prize package from Destination Salem and William Morrow. I originally hadn’t planned to post this video of our trip to Salem, MA., but I will share it for a short time. I created it in iMovie using photographs and video taken with our iPhones and Flip camera. It’s a little distorted to fit here, but not substantially so. It clocks in at about 11 minutes. We will probably go in July. Dylan and Maggie will most likely come with us. It’s weird. You see these contests online and enter for the hell of it, not thinking you could win, but definitely thinking why not? It takes a minute. You know ultimately someone wins these things, but you never think it will be you. This time it was, and I am so excited. I actually don’t know how to put how I feel into words. I still don’t believe I won. First, I received an e-mail from HarperCollins informing me that I won The Map of True Places Sweepstakes. I enter contests like this all the time, but I never have any expectation of winning. 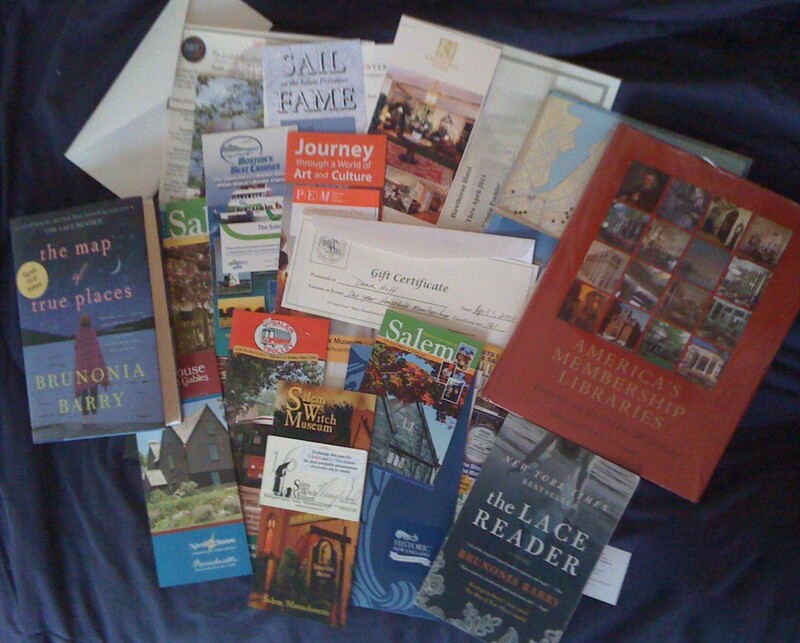 My prize is a weekend in Salem, Massachusetts, a place I have always wanted to visit (especially as an English teacher). I am so incredibly excited. I hardly know how it happened. Like I said, I enter these contests whenever one strikes my fancy, but how exciting! Second, I am slowly catching up with my Instructional Technology coursework. I read and took quizzes on three chapters of Educational Research yesterday. I didn’t too badly on the quizzes either, especially considering the difficulty of the quizzes. Today I wrote a short paper critiquing a journal article for the same course. I am virtually caught up in this course based on the schedule I set for myself. What I would like to do this week is get a little ahead in both this course and Multimedia Authoring so that I can be sure to finish both courses by the end of the semester. Once again, I find myself wishing we didn’t use grades to evaluate. I would much rather receive the feedback and a pass/fail. Grades stress me out. I hate giving them to my students, and as a student I hate worrying about them. Finally, I noticed a small crack in the back case of my iPhone about half an inch long originating at the center of the docking port. I have scheduled Genius Bar appointments twice, but canceled them so I could continue working or not feel pressed for time completing other activities. Finally, I decided it bothered me enough to bring in and see what would happen. The Genius at the Apple Store examined the phone, determined somehow that I didn’t cause the damage by dropping it (not sure how he figured it out; I didn’t cause the damage that way, but I admit to having dropped it, although not hard—maybe it was the location of the crack), checked on my warranty (glad I got AppleCare), and replaced the phone. I’ve had it since December 2008, so it wasn’t new. It was in good shape, though the corners were chipped (I didn’t used to have a case for it; now I do), and a tiny scratch marred the otherwise perfect screen. I bought some crystal film protectors to prevent damage to the new phone’s screen and immediately put it in the case. I hope I can keep this one in pristine shape with some extra care. So all in all, a really, really good day. Plus it’s spring break! Bonus! In book news, I’m still reading The Annotated Pride and Prejudice and keeping up with Crime and Punishment as best as my schedule and interest will allow (I’ll be glad to finish that one and begin Gulliver’s Travels). I am thoroughly enjoying the audio version of Jonathan Strange and Mr. Norrell. I am planning to read about the Once Upon a Time Challenge to see if I can participate.